About "NIV Journalling Bible Dark Red With Elastic Closure"
Let the wisdom of the Scriptures inspire your Bible journalling in this special ruby anniversary edition of the NIV. Wisdom is treasure. Better than treasure, as Proverbs suggests, for it can be found by reading and meditating on the Word of God in the Bible. The New International Version is celebrating its fortieth anniversary, and this ruby-themed Journalling Bible is one of a trio of special editions published to mark the occasion. With high quality, thick Bible paper and extra-wide blank margins for note-taking and referencing, this Bible allows you the space to respond creatively to the wisdom you find within. Use the extra room to write prayers, illuminate verses, add cross-references and colour-in your own drawings. The Bible includes two ribbon markers and a presentation page. First published in British English in 1979, the New International Version is the world's most popular modern English Bible. It is renowned for its combination of reliability and readability and is ideal for personal reading, public teaching and group study. - quick links to find inspiration and help from the Bible in different life situations. This edition uses British spelling, punctuation and grammar to allow the Bible to be read more naturally. 'For wisdom is more precious than rubies, and nothing you desire can compare with her.' (Proverbs 8:11, NIV)Wisdom is treasure. Better than treasure, as Proverbs suggests, for it can be found by reading and meditating on the Word of God in the Bible. 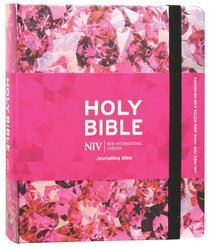 The New International Version is celebrating its fortieth anniversary, and this ruby-themed Journalling Bible is one of a trio of special editions published to mark the occasion. With high quality, thick Bible paper and extra-wide blank margins for note-taking and referencing, this Bible allows you the space to respond creatively to the wisdom you find within. Use the extra room to write prayers, illuminate verses, add cross-references and colour-in your own drawings. The Bible includes two ribbon markers and a presentation page. First published in British English in 1979, the New International Version is the world's most popular modern English Bible. It is renowned for its combination of reliability and readability and is ideal for personal reading, public teaching and group study. This Bible also features:- clear, readable 7.25pt text - easy-to-read layout - shortcuts to key stories, events and people of the Bible - reading plan - book by book overview - quick links to find inspiration and help from the Bible in different life situations.This edition uses British spelling, punctuation and grammar to allow the Bible to be read more naturally. Royalties from all sales of the NIV Bible help Biblica in their work of translating and distributing Bibles around the world.